Around my house, we do alot of laundry. I am still in the process of finishing up the potty training of my oldest son, who will be 4 in June. He recently decided that he wanted to be a big boy (after months of me trying to get him to potty train) and so we switched from pull-ups to big boy underwear. Well, if you have ever potty trained a child with underwear then you know that you have the potential to go through ALOT of pants and undies. I have been using my washing machine a whole lot more in the past two weeks and although I don't like the extra work, I LOVE that he is potty training and doing so well at it! Purex has once again come out with an outstanding, new product that will not only help my laundry feel soft, but also smell amazing! Good smelling laundry is a MUST around here and Purex has never let me down when it comes to this. 30 days of long lasting Crystals freshness! Who knew that one little sheet could do so much? Purex Crystals Dryer Sheets don’t just reduce static cling and leave your family’s laundry soft and smelling fresh: They can also keep your whole house smelling fresh for weeks not days! Choose your favorite Purex Crystals fragrance and tuck a sheet in hampers, in the linen closets, and any other laundry storage areas. These new Purex Crystals Dryer Sheets have three times more fragrance than the other Purex Dryer Sheets and they are just as effective when it comes to static cling too! You can choose from Fresh Spring Waters or Lavender Blossom when it comes to the scents. So, I was recently sent a box of the Purex Crystals Dryer Sheets in the Fresh Spring Waters scent. Like most of the Purex products, the shipment box smelled SO good when it arrived. It sat in my kitchen for a few days and while it was there, it helped my kitchen smell so nice and fresh. I was sort of sad when I had to move the box to the basement to where the washing machine and dryer are. These dryer sheets are very soft and fluffy. They feel like they have really good softener in them too. Like I said before, the scent is amazing. I was very excited to give them a try during my laundry day. All you do is toss a sheet into the dryer with your wet laundry and use these just like you would any other dryer sheets. When my clothes came out of the dryer, they smelled really pretty. I didn't notice that they smelled any STRONGER than when I used my other dryer sheets but the clothes did smell nice. I would say that yes, the dryer sheets smelled great but the scent wasn't any stronger than what I was used to. So, in my opinion Purex Crystals Dryer Sheets are great for static and also for making your laundry smell nice. It is a product that I would buy again but probably wouldn't use in place of what I normally use. I would love to try these in my shoe closet, clothing drawers and other places because I think that they smell wonderful on their own! Just the fact that they made my kitchen smell great while still in the box makes me think that they would smell nice just sitting around in the smellier places of my home. Purex Crystals Dryer Sheets retail for about $6 per box. Disclaimer: As a Purex Insider, I received no monetary compensation for this post. Purex did provide me a free sample of their Purex Crystals Dryer Sheets for review purposes. All quotes and stock photos are from the Purex website and email. Prizes are in coupon form and will be mailed by myself. This blog is not responsible for lost, damaged or stolen prizes and in this case, I am not responsible for replacing coupons under any circumstances. All thoughts and opinions are 100% mine. 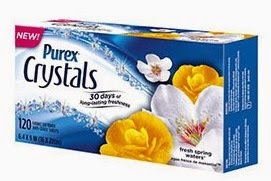 I use a variety of things depending on my coupons, but I like Purex Crystals a lot. My favorite is the April Fresh Downey liquid. My favorite brand of dryer sheets is Bounce. I enjoy the purex dryer sheets. I like Downy liquid fabric softener. Currently my favorite Fabric Softener and/or Dryer Sheet Brand is Bounce but I would love to try Purex's new products. Lately I have been using Arm & Hammer dryer sheets. I have been using downy fabric softener lately. I've usually used Snuggle fabric softener. i love Gain products !! ! ! ! I like Gain fabric softener sheets. I am using Gain dryer sheets right and like them. I currently use Bounce dryer bars…but they get so darn expensive! I'd love if these work well! I love downy and snuggle. I like Purex brand as my favorite brand have used them more than any other brand. My favorite fabric softener is Downy! My current favorite dryer sheet is Bounce. My favorite is Gain! I love the way gain smells! I really like the smell of downey. I take an inexpensive scent and dye free sheet and lightly spray it with a scent I like. Usually, the Fabreeze with the Gain infusion. It works for me!!! !